The deregulation binge that tanked global markets is a bullet deliberately fired into the economy by ideologues, heedless of the ultimate cost to taxpayers. And John McCain cheered them on. 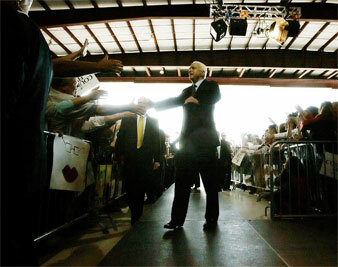 AP Images John McCain presses the flesh in Cedar Rapids, Iowa. This article originally appeared on DailyKos.com. James Bond’s wealthy nemesis may have had an obsession with gold, but he judged, quite correctly, that if people keep putting your plans awry, that was likely their intent. In 1982, the same year John McCain entered the Senate, a bill was put forward that would substantially deregulate the savings and loan industry. The Garn-St. Germain Depository Institutions Act was an initiative of the Reagan administration, and was largely authored by lobbyists for the S&L industry–including John McCain’s warm-up speaker at the Republican National Convention, Fred Thompson. The official description of the bill was “An act to revitalize the housing industry by strengthening the financial stability of home mortgage lending institutions and ensuring the availability of home mortgage loans.” Considering where things stand in 2008, that’s enough to make you wince. It should. Seven years later, the S&L industry was collapsing. What was the cause? Garn-St. Germain had handed the S&Ls a greatly expanded range of capabilities, allowing them to go head to head with full service banks, but it hadn’t handed them the bank’s regulations. Left to operate in an anarchistic gray area, S&Ls had chased profits, indulged in amazing extravagances and cranked out enough cheap mortgages to fuel a real estate boom. They had also experimented with lots of complex, creative–and risky–investments, even though they didn’t have the economic models to really determine the worth of the things they were buying. The result was a mountain of bad debts and worthless “assets.” Does any of that sound eerily (or nauseatingly) familiar? It wasn’t a foregone conclusion. In 1985, three years after the deregulation of the S&Ls, the chairman of the Federal Home Loan Bank Board saw that the situation was already looking bad, with potential to get much worse. To try to head off disaster, he instituted a rule to limit the amount and types of investments S&Ls could carry on their books. However, many savings and loans–among them Lincoln Savings & Loan Association of Irvine, California, which was headed by a fellow named Charles Keating–promptly ignored these rules. Now enters a familiar cast of characters. First to pop up was the universally beloved Fed-chief-to-be Alan Greenspan. Greenspan argued against the loan board’s new rules, and persuaded Reagan to appoint one of Keating’s pals to the board to blunt the requirements. A quintet of senators, among them John McCain, began having meetings with both the management at Lincoln and the regulators at the loan board. With their help, Lincoln was able to stay in business an additional two years, at the end of which they failed–taking the life savings of 21,000, mostly elderly, investors with them. How involved was John McCain? McCain and Keating had known each other since 1981 and had become fast friends. Of all the “Keating Five,” it was McCain who really moved into the life of the Lincoln S&L chief. The two men vacationed together multiple times, with the whole McCain clan (babysitter included) heading out for Keating’s private Caribbean property on Keating’s private jet. McCain didn’t think to actually report these trips, or pay for them, until the investigators were breathing down his neck. And McCain took payment in more than just vacations. Keating and other members of Lincoln’s parent company padded McCain’s pockets with $112,000 in campaign contributions. In John McCain’s biography, he called his meetings with Keating and regulators “the worst mistake of my life,” though from the text you’d think this was a spur-of-the-moment decision, not something that McCain did repeatedly over a space of years. Still, you might think that a “worst mistake” would stay fresh in his memory. Gramm-Leach-Bliley reversed those rules, allowing not only more bank mergers but for banks to become directly involved in the stock market, bonds and insurance. Remember the bit about how S&Ls failed because they didn’t have the regulations that protected banks? After Gramm-Leach-Bliley, banks didn’t have that protection either. Gramm wasn’t done. The next year he was back with the Commodity Futures Modernization Act, which was slipped into a “must pass” spending bill on the last day of the 106th Congress. This act greatly expanded the scope of futures trading, created new vehicles for speculation and sheltered several investments from regulation. As with both Gramm-Leach-Bliley and Garn-St. Germain, large parts of this bill were written by industry lobbyists. This included the “Enron loophole” that exempted energy trading from regulation, and was written by (big surprise) Enron lobbyists working with Gramm. Not coincidentally, Senator Gramm, the second-largest recipient of campaign contributions from Enron, was also key to legislating the deregulation of California’s energy commodity trading. Thanks to this fortunate trifecta of Gramm-crafted legislation, Enron was able to create “EnronOnline” and trade electricity in California with absolutely no oversight or transparency. They quickly worked out how to game the system. Previously, there had been only one Stage 3 rolling blackout in the history of California. Within months, the system had been manipulated by traders to generate thirty-eight such blackouts and wholesale electrical prices had gone up more than 3000 percent. Despite production capacity equal to four times the demand during winter, energy traders even engineered a blackout in mid-January. During the confusion of these deliberate “shortages” and “price spikes,” the California administration of Gray Davis–blind to speculator manipulations because of the walls erected by Gramm’s legislation–was forced to sign energy contracts at enormous rates. There was little choice, because most of California’s public utilities were on the brink of bankruptcy from the rising wholesale prices. In a single year, the legislation allowed speculators to bring the state to its knees. Enron alone looted California of $11 billion. The manipulations of the energy market were also a major factor in Davis getting the hook, helped usher the governator into power, and they still have repercussions in California’s budget battles today. By the end of that year, the depth of Enron’s deception could no longer be hidden, and the whole company came crashing down in the largest bankruptcy in history–at the time. This brought more billions lost in mutual funds and pension funds across the country, and played a major role in the economic downturn of 2001. But that was only the second act. The combination of Gramm-Leach-Bliley and the Commodity Futures Modernization Act was a toxic cocktail whose total damage was greater than the sum of its parts. The first promoted bank buyouts and mergers that reached such an insane pitch that the average consumer could keep up only by tracking the changing names on their checks and credit cards. Mercantile buys Ameribanc and Mark Twain. Firstar buys Federated and First Colonial. US Bancorp buys Mercantile and Firstar. And, because it allowed brokerages and insurance companies to mingle with banks, the act cemented a trend that was already (and illegally) underway, in which all those terms had become rather quaint. Is Wachovia a savings bank, an investment bank, a brokerage or an insurance provider? The answer is “yes.” In allowing financial institutions to grow to Godzilla-sized proportions, Gramm-Leach-Bliley helped ensure that we would have properties that were “too big to fail.” Rather than choosing to enforce rules that kept these institutions apart, the deregulators chose to create monster bankeragasurance businesses whose downfall (and existence) was enough to threaten the whole system. But if Gramm-Leach-Bliley removed the limits on size and scope, these new institutions still needed fuel. With many financial transactions operating on razor-thin margins, and increasing automation sapping the profits from trading of all sorts, they needed a new way to generate the funds required to swallow their brethren in the merged fiscal corporation pond. For that, the Commodity Futures Modernization Act was a godsend. Among those instruments which the CFMA sheltered from regulatory scrutiny was something called the “credit default swap.” A kind of insurance one bank could exchange with another, credit default swaps supposedly made it safe for banks to take on ever riskier forms of debt. The act didn’t invent these swaps, though they were relatively new. But the act meant that they would be not only unregulated but almost perfectly opaque, thus placing the swaps in a hyper-rich growth situation. No one had any idea what these things were actually worth; they were traded “over the counter” without being administered by any exchange, and even the SEC could monitor their existence only indirectly. So who would love a new kind of financial instrument that was difficult to understand, invisible to regulators, and impossible for even the whizziest of Wall Street whiz kids to value? Guess. When questioned about his support of Gramm’s legislation, John McCain called his friend (and by then, campaign co-chair) Gramm “one of the smartest people in the world on the economy” and pointed out that Greenspan also favored the acts Gramm and his coalition of lobbyists had authored. If both Gramm and Greenspan were on his side, McCain couldn’t possibly be in the wrong. From the beginning, there were plenty of people in the financial community whose opinion of these unregulated credit swaps was not as rosy as that of Gramm, Greenspan and McCain. Chief among those speaking in opposition was SEC Chairman Arthur Levitt. Levitt argued that what the industry needed was more transparency, especially when it came to complex instruments like default swaps, and he testified to this before Gramm’s Senate Banking Committee,. Credit default swaps did allow the banks to share risks. So much so, that banks raced each other in an effort to find more risks. They made it possible for the down payment on homes to become 3 percent, 1 percent, 0 percent. Skip the credit check, avoid the employment requirements, damn the torpedoes, full speed ahead! We’ve got a credit default swap, we can do anything! The encouragement and “safety” that credit default swaps provided made the subprime mortgage market possible. Just as with the deregulation of S&Ls in the 1980s, the market provided a flood of easy credit. The result was a real estate boom, soaring home prices and a plague of Flip that House! shows on cable. As the banks piled up crappy mortgages, they heaped on ever more of the credit default swaps–and they still had no idea how to value the things. Worse, they began to trade the swaps themselves as if they were an investment, treating them like something worth holding instead of a big bundle of cartoon bombs whose fuses were already lit. Since very few loans were falling into default at the time, owning a default swap seemed like a way to collect fees without ever paying. Banks wanted more, and more, and more. A secondary market for trading swaps exploded into existence, and swaps were traded with absolutely no consideration for the nature or quality of the underlying investment. Worse still, no one regulated who could buy a swap, so it was (and is) perfectly possible for a company to acquire swaps that theoretically cover billions of dollars in loans, even if that company doesn’t have a red cent on hand to cover those swaps should the loans default. The value of the entire US Treasuries market: $4.5 trillion. The size of the US stock market: $22 trillion. As in three times the whole US gross domestic product, Bob. And the truth is that Moon probably underestimated. The unregulated and poorly reported credit default swaps may have actually passed $70 trillion last year, which means that they were about $5 trillion more than the GDP of the entire world. With some regularity over the last eight years, fiscal whistleblowers have tried to raise their hands and register a protest. Um, sirs? Is it altogether a good idea to run up debts exceeding all the assets it’s even possible to hold? But so long as no one actually had to pay off on the swaps, the party went on. Even usually conservative (in the fiscal sense) companies like AIG started to worry that they were being left behind and leapt headlong into the swap pool. Shortly after Greenspan’s departure in 2006, the Federal Reserve took the unusual step of issuing a joint statement along with the SEC to warn about the risks associated with credit default swaps. But by that point, the damage was already severe. If swaps lost their value, most of those who had played the game would find themselves in companies whose worth was valued in pocket change. The only solution was to cover the problem with still more swaps and keep moving. Then a funny thing happened. After years in which banks had handed out loans willy-nilly, guarded by the indestructible swap, people and companies started to really default on those loans. Credit slowed, home prices fell, and the whole snake started to eat itself, tail first. Suddenly, credit default swaps were not sources of limitless cash. It turns out that an insurance policy–even a secret, unregulated policy–is occasionally expected to pay. Speculators started to look at all the paper they were holding and for the first time realized it could all be worthless. Worse, it could (and did) represent a massive debt. Only no one had the funds to cover it all. When Bear Stearns fell apart last March, it was only suspected that a big part of the effort in saving the giant investment bank was keeping their holdings in credit default swaps from unraveling and spreading to other institutions. Naturally, part of solving this problem involved creating a new credit default swap to cover Bear Stearns’s potential debt. But the all-purpose swap was starting to lose its power. Shortly after Bear Stearns went belly up, AIG reported the largest quarterly loss in the company’s history, taking a $11 billion hit on revaluing its holdings of swaps. The party was definitely coming to a close. When AIG finally collapsed this week, there was no doubt about the primary cause of its failure. The previously well-grounded company had “gotten itself involved with something called credit default swaps.” Point of irony alert: Arthur Levitt now serves on the AIG board–or at least he did until the government had to take over most of AIG to salvage the company from the very idiocy Levitt had warned of in 1999. This week, the Bush administration announced the beginnings of a plan to salvage what remains of the financial markets. At first glance, it appears that the plan will consist mainly of creating a kind of “garbage pit,” a company–some new version of the Resolution Trust that was created during the S&L crisis–into which those people who have dabbled in bad debts can toss their problems. The cost to the taxpayers is expected to be in the area of $1 trillion. The deregulation of the California electricity market, along with the protections provided to Enron through Phil Gramm’s lobbyist-written legislation brought blackouts and failure, and left taxpayers holding the bag. But the people who engineered that event–people like Gramm and Greenspan–had already seen what happened with the S&Ls and they should have known better. Still, perhaps that was only coincidence. The subprime mortgage crisis that has not only come so close to utterly destroying the markets but has also ruined the value of many people’s homes and left millions with mortgages they couldn’t pay was also the outcome of the deregulation created by these men. The very predictable outcome. When taxpayers are left holding the bag for $1 trillion this time around, it’s hard to believe it’s any sort of accident. This is enemy action. This is a bullet deliberately fired into the economy by men willing to exercise their ideology regardless of the cost to taxpayers. John McCain may not have had his finger directly on the trigger, but he was there. He assisted. He not only cheered them on but claimed until last month that he was also “primarily a deregulator.” These were his personal friends and philosophical comrades. It may come as a surprise to the champions of deregulation, but nobody likes regulation. The restrictions that were placed on banks, S&Ls and other institutions in the 1930s weren’t put there because someone thought it would be fun. They were put in place because they addressed problems that had just been clearly and painfully revealed. They were put in place because they were necessary. It’s bad enough if John McCain didn’t know that. It’s far worse if he did. Mark SumnerMark Sumner, better known as the editor "Devilstower" on Daily Kos, is the author of thirty-two novels, a past winner of Writers of the Future, and has been nominated for both the Nebula and World Fantasy Awards.